Explain the origin of Ohm’s law. Calculate voltages, currents, or resistances with Ohm’s law. Explain what an ohmic material is. What drives current? We can think of various devices—such as batteries, generators, wall outlets, and so on—which are necessary to maintain a current. All such devices create a potential difference and are loosely referred to as voltage sources. When a voltage source is connected to a conductor, it applies a potential difference that creates an electric field. The electric field in turn exerts force on charges, causing current. Figure 1 shows the schematic for a simple circuit. A simple circuit has a single voltage source and a single resistor. 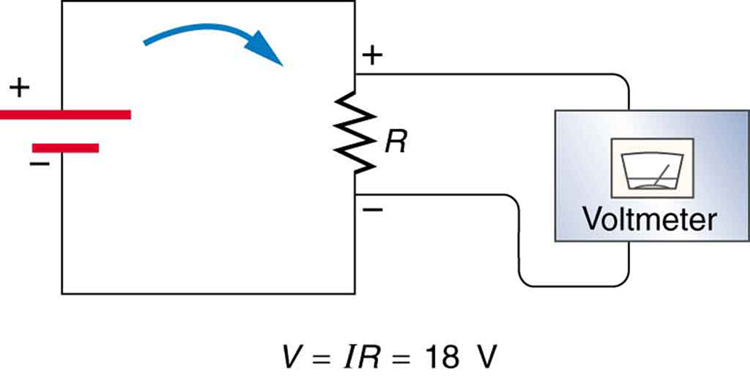 The wires connecting the voltage source to the resistor can be assumed to have negligible resistance, or their resistance can be included in . Figure 1. 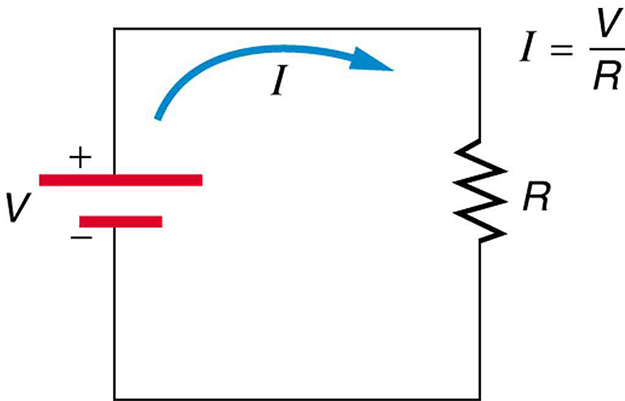 A simple electric circuit in which a closed path for current to flow is supplied by conductors (usually metal wires) connecting a load to the terminals of a battery, represented by the red parallel lines. The zigzag symbol represents the single resistor and includes any resistance in the connections to the voltage source. What is the resistance of an automobile headlight through which 2.50 A flows when 12.0 V is applied to it? We can rearrange Ohm’s law as stated by and use it to find the resistance. This is a relatively small resistance, but it is larger than the cold resistance of the headlight. As we shall see in Chapter 20.3 Resistance and Resistivity, resistance usually increases with temperature, and so the bulb has a lower resistance when it is first switched on and will draw considerably more current during its brief warm-up period. Resistances range over many orders of magnitude. Some ceramic insulators, such as those used to support power lines, have resistances of or more. A dry person may have a hand-to-foot resistance of , whereas the resistance of the human heart is about . A meter-long piece of large-diameter copper wire may have a resistance of , and superconductors have no resistance at all (they are non-ohmic). Resistance is related to the shape of an object and the material of which it is composed, as will be seen in Chapter 20.3 Resistance and Resistivity. Figure 2. The voltage drop across a resistor in a simple circuit equals the voltage output of the battery. In a simple electrical circuit, the sole resistor converts energy supplied by the source into another form. Conservation of energy is evidenced here by the fact that all of the energy supplied by the source is converted to another form by the resistor alone. We will find that conservation of energy has other important applications in circuits and is a powerful tool in circuit analysis. See how the equation form of Ohm’s law relates to a simple circuit. Adjust the voltage and resistance, and see the current change according to Ohm’s law. The sizes of the symbols in the equation change to match the circuit diagram. A simple circuit is one in which there is a single voltage source and a single resistance. One statement of Ohm’s law gives the relationship between current , voltage , and resistance in a simple circuit to be . Resistance has units of ohms ( ), related to volts and amperes by . There is a voltage or drop across a resistor, caused by the current flowing through it, given by . 1: The drop across a resistor means that there is a change in potential or voltage across the resistor. Is there any change in current as it passes through a resistor? Explain. 2: How is the drop in a resistor similar to the pressure drop in a fluid flowing through a pipe? 1: What current flows through the bulb of a 3.00-V flashlight when its hot resistance is ? 2: Calculate the effective resistance of a pocket calculator that has a 1.35-V battery and through which 0.200 mA flows. 3: What is the effective resistance of a car’s starter motor when 150 A flows through it as the car battery applies 11.0 V to the motor? 4: How many volts are supplied to operate an indicator light on a DVD player that has a resistance of , given that 25.0 mA passes through it? 5: (a) Find the voltage drop in an extension cord having a resistance and through which 5.00 A is flowing. (b) A cheaper cord utilizes thinner wire and has a resistance of . What is the voltage drop in it when 5.00 A flows? (c) Why is the voltage to whatever appliance is being used reduced by this amount? What is the effect on the appliance? (c) The voltage supplied to whatever appliance is being used is reduced because the total voltage drop from the wall to the final output of the appliance is fixed. Thus, if the voltage drop across the extension cord is large, the voltage drop across the appliance is significantly decreased, so the power output by the appliance can be significantly decreased, reducing the ability of the appliance to work properly. 20.2 Ohm’s Law: Resistance and Simple Circuits by OpenStax is licensed under a Creative Commons Attribution 4.0 International License, except where otherwise noted.